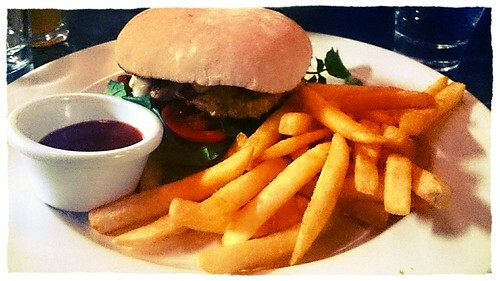 Crocodile Burger by The Rocks, a photo by Curry puff, lah! on Flickr. So my friend came over Sydney and we decided to hang around one afternoon around the harbour area. By the time dinner came, it was hard for me to choose a restaurant because I realize that on Sundays, most restaurants close quite early in Sydney. So we chose a random restaurant at the Rocks which had the most Australian flavors I can imagine. Now what makes Australian flavors? I have no bloody idea. Maybe it’s aboriginal food? It’s not like Master Chef has taught me to properly assess what makes Australian cuisine. If anything, it has shown me how diverse it has become. So to find an Australian restaurant was quite daunting. As we sat down for dinner, we thought why not take something crazy, at least? That night, we thought it wouldn’t hurt to have a crocodile. They’re mean animals anyway. No one would cry if the world lost another croc. Maybe. Anyway, we gave it a shot expecting a profound or new flavor or texture. Instead, we got chicken. Croc tastes like chicken. Now I don’t know if that’s how it’s supposed to be but yeah… I guess we had higher expectations from a croc. Wow Gab! You’ve got some courage there! XD I… don’t even know what a monitor lizard is. Anong tawag nyan sa atin? Snake tastes chickeny but more fishy. In a way, I was relieved but yeah.